Sinn Féin's national chairperson has been accused of being "delusional" for saying republicans inspired the civil rights campaign in Northern Ireland. Bernadette McAliskey, who was involved in the campaign and later became an MP, said his claim has no basis in fact. She described his comments as incoherent and silly "ramblings". 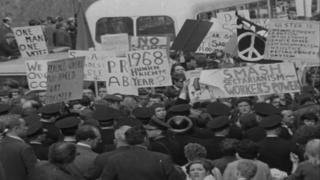 In the late 1960s, the Northern Ireland Civil Rights Association began to work for change. It catalogued discrimination against Catholics in housing and employment and demanded equal voting rights for all in local government elections. Many unionists regarded the civil rights movement with deep suspicion believing the group's main aim was to create a united Ireland. Writing on the Eamonn Mallie.com website, Mr Kearney argued that it was the strategic decision of the IRA and Sinn Féin leaderships that helped to form the civil rights movement. Mr Kearney told the BBC programme 'The View' that: "Republicans were involved. The IRA and the Sinn Féin leaderships encouraged their activists to organise and to campaign under the umbrella of the civil rights movement, alongside other democrats other political activists - human rights activists, communists and trade unionists. "So, the role of republicanism was central to the emergence of the civil rights movement along with many others." However, some insist that Sinn Féin is now trying to claim a place in history that is not accurate. Bernadette McAliskey, who was then known as Bernadette Devlin, was a leading figure in the civil rights movement and was one of the founding members of People's Democracy established in 1968. She later became the youngest woman to be elected to Westminster when she won the Mid Ulster by-election as a unity candidate in 1969. She is very critical of Mr Kearney's analysis of the civil rights movement. "I really don't have the political space in my head - and I don't think anyone should - to engage in the delusional silliness of individual ramblings that people have about the past." The former MP told the programme: "With respect, I think the article that Declan Kearney wrote is delusional... it has very little basis in reality, in fact or in coherence." Image caption Bernadette McAliskey called Mr Kearney's analysis "delusional silliness"
Eamonn McCann was another leading figure in the civil rights campaign back in the 1960s and early 1970s. The former People Before Profit MLA questions Sinn Féin's recollection of the era. "I think Sinn Féin are trying to colonise history," Mr McCann said. "They are trying to claim every advance and every bit of militancy over all the years of the Troubles as their own and, of course, this is not true. "Sinn Féin is attempting to portray themselves - and more importantly to portray the IRA - as the natural inevitable outgrowth of the civil rights movement which is certainly not true." Others insist that Sinn Féin is using the history of the civil rights campaign to justify the subsequent actions of the IRA. Brid Rodgers was involved in the early days of the civil rights movement and later became deputy leader of the SDLP and a minister in the Northern Ireland Executive. She dismissed Sinn Féin's analysis. "The civil rights movement was about equality. The republican movement and Sinn Féin and the IRA were about 'Brits Out' and Irish unity by force. "So it is rewriting of history to pretend that the republican movement fought a war to get equality. They did not. "They fought a war to get the Brits out and to unite Ireland, neither of which they succeeded in doing." So, are Sinn Féin laying claim to something that they have no right to by suggesting the party and the IRA were influential? Mr Kearney insisted his reading of history is correct. "I have not said the leading members of the civil rights movement were exclusively IRA or Sinn Féin activists," he said. "The reality is that republican activists were involved directly, with many many others, with the formation of the civil rights movement." This week, Sinn Féin continued to make remarks about the civil rights campaign when the MLA Alex Maskey tweeted: "Unfortunately it took more than the CRA (the Civil Rights Association) to secure rights in the putrid little statelet NI (Northern Ireland) "
It is a tweet that did not make an impression with Ms McAliskey. "Whatever it is that Alex Maskey is trying to say, he would want to say that in a way that reflects some depth of political thought or understanding, rather than a developed culture of opening your mouth without any prior thought and allowing abuse to fall out of it." Fifty years on, the history of the civil rights movement still divides opinion. It was a defining moment in the history of Northern Ireland. Even though the political landscape has changed after five decades, an agreed narrative remains elusive. Stephen Walker's report will be broadcast as part of The View on BBC One Northern Ireland at 22:40 GMT on Thursday 8 February.